~Insert_Title~ | A lot about a little. . . And maybe a little about a lot: Random thoughts on Linux, Life, and Land-Lubbers. A lot about a little. . . And maybe a little about a lot: Random thoughts on Linux, Life, and Land-Lubbers. I have officially moved. Visit my new site at jabstaboops.andthesethygifts.com ! Posted by Paco on April 22, 2012 in Random. Who can seriously be worthy of titles like “terror of demons” and “light of patriarchs”? Today, on March 19, we celebrate the feast of a man who is one of the manliest of all men. This man is St. Joseph. Some would argue that St. Joseph was just another man. I argue that he is the man. As the person charged with raising the Son of God and protecting the Blessed Mother, it is only logical that his character could have only been of the highest caliber. He is, in fact, referred to as, “a just man” (Matt 1:19), and he shows it in the way he lives his life. He was a true gentleman, even when his wife-to-be was found to be pregnant, he was, “unwilling to expose her to shame, ” (Matt 1:19) and so he decided to divorce her quietly. In this can be seen a striking disregard of self. His only concern was the preservation of Mary’s honor, and not a thought was given to how such an occurrence would affect himself socially. The penalty for what would have been perceived as adultery would have been stoning for Mary. In turn, his divorcing a pregnant woman would probably not have gone over well in their community. In his resolution, he put aside all thoughts for his own reputation in order to protect Mary’s. 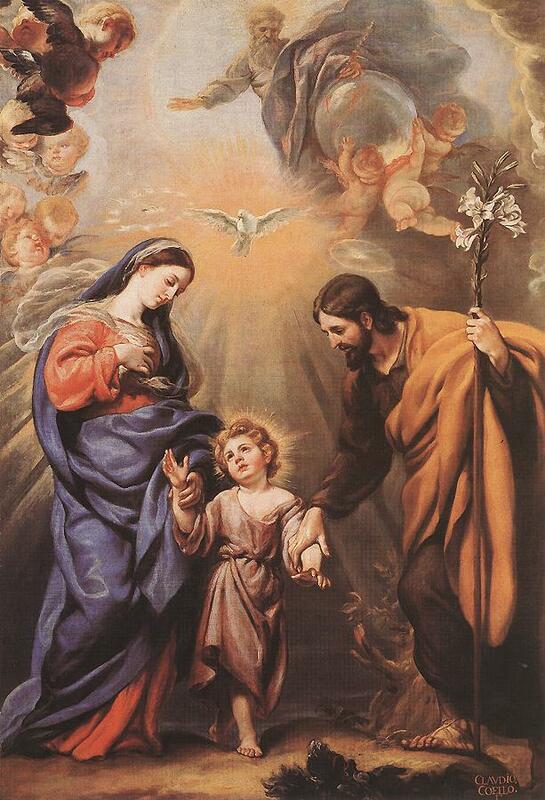 The flight to Egypt highlights just how committed to his family St. Joseph was. Having been warned in a dream of Herod’s plot to kill the Infant King, “Joseph rose and took the child and his mother by night and departed for Egypt.” It does not say, “Over the next few weeks, he packed his bags, sold their house, waited for a decent caravan, and departed for Egypt.” No, he rose and took the child and his mother by night, immediately. He was obedient and trusted God completely: when the angel instructed him, he followed without fail. They undoubtedly left everything but for a few bare essentials. They did not stop to say goodbye, as all of their neighbors were probably asleep. Joseph led his wife and child into a desert, where there would have been any number of hazards. And yet, his utter selflessness, trust, and decisiveness saved the Christ Child’s life. St. Joseph was truly a hero. He is a model that every boy, youth, and man should strive to imitate. However, in a culture with degraded standards of commitment, an emphasis on putting one’s own interests first, and open mockery of the ideals of chivalry and chastity, a young man attempting to imitate St. Joseph will almost certainly meet no small amount of malice. Ladies, this is no easy battle for men, please pray for us (and support your local chivalry!). Men, St. Joseph is an awesome guy. It’s easy to put Saints like him up on a pedestal, but this guy can seriously help us if we ask him, so let’s ask him! Suarez, Federico. Joseph of Nazareth. London: Scepter, 1984. Print. Pope John Paul II. Redemptoris Custos. Vatican City: 1989. Web. <http://www.vatican.va/holy_father/john_paul_ii/apost_exhortations/documents/hf_jp-ii_exh_15081989_redemptoris-custos_en.html&gt;. Posted by Paco on March 19, 2012 in Catholicism and tagged Catholicism, Character, Chastity, Holy Family, Honor, Manliness, St. Joseph, Support your local chivalry. Posted by Paco on March 14, 2012 in Random and tagged 12.04, beta, Consumer Preview, Pangolin, Precise, Ubuntu, Windows 8. Books, swords, computers, friends, family, fooood. I'm happy. Cheerful service is the highest form of leadership.